Miss Amber Reneé Rivero is the new reigning Miss Earth Belize 2013. Belize International Pageants Limited crowned the 21-year-old student of the University of Belize at ceremonies held on Saturday, August 24, 2013, at the Royal Orchid Hotel in Belize City. 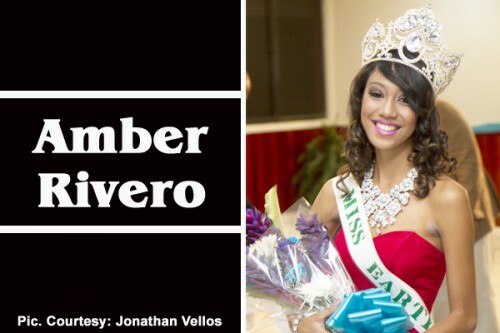 As Miss Earth, Amber is the official environmental ambassador of Belize. She will be representing her country at the Miss Earth International Pageant to be held in Manila, Philippines, in November 2013. According to a press release sent by Belize International Pageants Ltd., the previous queen, Miss Jessel Lauriano, gave her final address and passed on the torch to the newly crowned queen, Ms. Rivero, who said that she is proud to be able to showcase Belize’s natural wonders and help to make her country take its rightful place on the international scene. At the coronation ceremony, Amber also showcased the talent that she will be offering at the international pageant in November. She performed a masterful rendition of Adele’s “Someone Like You” on the violin, accompanied by steel pans being played by Benoit Coye and Feliece Zelaya. Karen Burke-Young, of Belize International Pageants, told Amandala that the Miss Earth Belize contest has been in existence for the past three years and is hosted by Belize International Pageants Ltd. For the first two years, a pageant was held to select Miss Earth Belize. However, this year, there was a selection process in lieu of the pageant, whereby contestants were assessed based on the information presented in their application juxtaposed against the required criteria for the competition. She told us that there were three applicants for Miss Earth Belize 2013.